And at that moment moment, the results and analysis of last night's presidential debate didn't seem important at all. But the debate did happen. And I think it will be remembered like that Ali/Frazier fight where they beat the crap out of each other but just one famous moment comes to mind beyond all others: Frazier knocking Ali down hard and then Ali popping right back up. Last night, Trump knocked himself down with his silly position that he may not accept the results of the election. That is what will be remembered. How self inflicted was that? Trump didn't have to say it. There are a million ways to answer it and the moment gets lost to time. But Trumps' "such a nasty woman" line took me aback more than anything. I didn't know Trump has a sister who is a federal appellate judge on the Third Circuit. 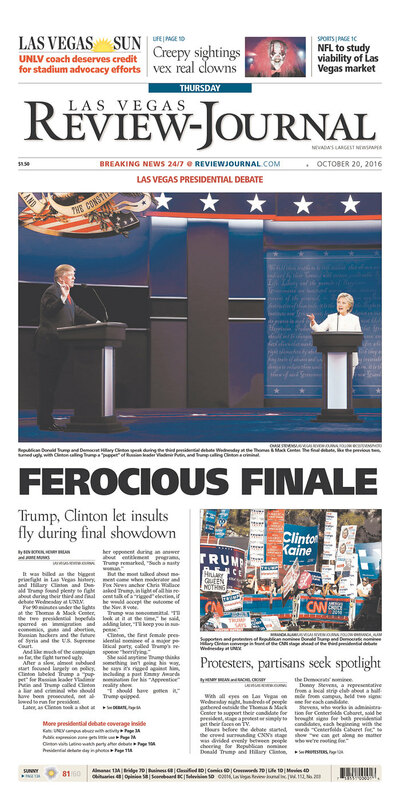 The local paper in Waxahachie was the third paper in the nation, and first in Texas, to endorse Trump. This was a bad week for DPS to claim they are monitoring school buses. From Austin yesterday: "An armed man posing as a policeman Tuesday tried to stop a school bus with an Anderson High School student on board . . . . "
My one and only admin assistant is in Vegas to see the Rolling Stones. That show was cancelled yesterday less than 24 hours before it was to start. My team of experts is projecting that Decatur will face Brownwood in the first round of the state football playoffs. Queen of "And Another" turned stripper turned Dr. Phil guest. In an incredibly rare move yesterday, the conservative Texas Court of Criminal Appeals ruled 6-3 to reverse the conviction of a couple for Injury to a Child by burning the child in hot water. They had both been sentenced to 25 years in prison. What is more newsworthy is that the case was not ordered to be retried but instead they were acquitted. The reason: Insufficient evidence or, in practical terms, there is no way a juror could believe beyond a reasonable doubt that they were guilty. If your initial emotion about that is anger, you must believe the couple is guilty. Why?